Susan Hutchison filed late Friday afternoon, just before the candidate-filing deadline, immediately becoming the best-known of more than two-dozen challengers in the race. Former state Republican Party chair Susan Hutchison is challenging Democratic U.S. Sen. Maria Cantwell’s bid for a fourth term in 2018. Hutchison filed late Friday afternoon, just before the candidate filing deadline, immediately becoming the best-known of more than two dozen challengers in the race. Hutchison called Cantwell “a leader of the left-wing elite that are destroying our state,” tying her to liberal Seattle politics, such as the city’s recently passed “head tax” on larger businesses. Ansley Lacitis, a spokeswoman for the state Democratic Party, dismissed Hutchison’s prospects. A Cantwell spokesperson did not immediately respond to a request for comment. Cantwell was elected to the Senate in 2000, upsetting incumbent Republican Slade Gorton. She was re-elected in 2006, beating former Safeco executive Mike McGavick, and in 2012, defeating state Sen. Michael Baumgartner of Spokane. Aside from Hutchison’s challenge, Democrats in Washington state were mostly playing offense in the state’s midterm congressional races, while Republicans were focused largely on breaking Democratic majorities in the Legislature. Prior to Hutchison’s filing, Cantwell had faced only little-known rivals, including Art Coday, a Lynnwood doctor who also ran in the 2012 Senate primary; Dave Bryant, a former Navy commander and Boeing manager; and Keith Swank, a Seattle police captain who described himself in an announcement video as a supporter of President Donald Trump and of a wall on the border with Mexico. Another of Cantwell’s announced Republican challengers is Joey Gibson, leader of the Patriot Prayer group whose demonstrations have triggered counter protests and violence, including at the University of Washington in February. 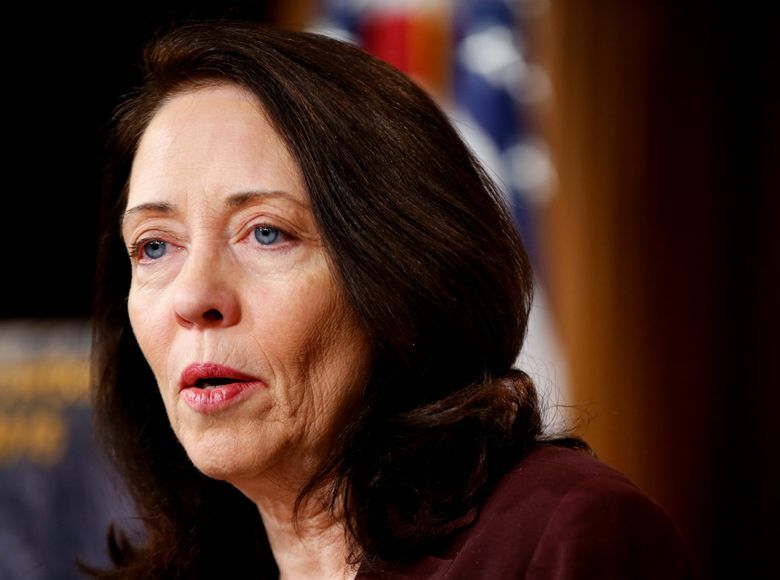 Anticipating no apparent big-name challenger, Cantwell had made no announcement on why she is seeking a fourth term when she filed for re-election this week. Her campaign website has not been updated since 2012. Her re-election campaign has raised more than $8 million and had $4.7 million in the bank as of the end of March, according to Federal Election Commission filings. Top donors include personal-injury lawyers, environmentalists and employees of Microsoft, Boeing and Amazon, according to the Center for Responsive Politics. 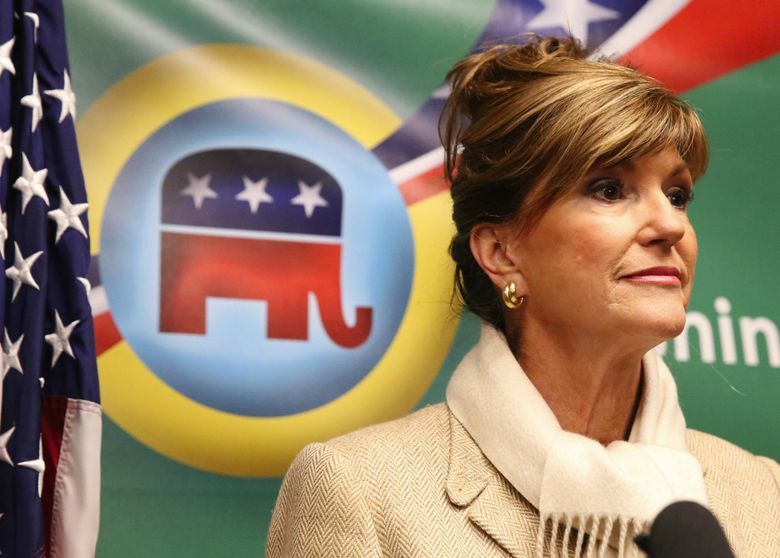 A former television news anchor, Hutchison served as state Republican Party chair from 2013 until stepping down earlier this year, amid speculation she might be appointed to an ambassadorship or other position in President Donald Trump’s administration. In a state where Trump received just 38 percent of the vote in 2016, Hutchison as GOP chair strongly defended the president — even from attacks by fellow Republicans. She made national news in 2016 for accosting Texas Sen. Ted Cruz at the Republican National Convention in Cleveland, calling him a “traitor” for failing to endorse Trump during a floor speech. Hutchison’s first run for political office came in 2009, when she lost the race for King County executive to Dow Constantine. In the state’s U.S. House races, national attention will likely focus on Washington’s 8th Congressional District, where three-time Republican statewide candidate Dino Rossi is hoping to succeed retiring U.S. Rep. Dave Reichert, R-Auburn. Rossi faces three main Democratic rivals — all political newcomers — who will be battling to advance past the primary to a November matchup. Kim Schrier, a pediatrician from Sammamish, is the leading fundraiser. Schrier has serious competition in Jason Rittereiser, an attorney and former deputy prosecutor with Ellensburg roots, and Shannon Hader, of Auburn, former director of the global HIV division at the Centers for Disease Control and Prevention. In the state’s other marquee congressional race, U.S. Rep. Cathy McMorris Rodgers of Spokane, the fourth-ranking House Republican, is being challenged by former Democratic state Sen. Lisa Brown in Eastern Washington’s 5th Congressional District. A second Republican, Jered Bonneau, also has filed in the race, as has Dave Saulibio, who listed his party as the “Trump Populist Party.” Saulibio told The Spokesman-Review newspaper that McMorris Rodgers doesn’t support the president enough. In southwest Washington’s 3rd Congressional District, U.S. Rep. Jaime Herrera Beutler, R-Vancouver, has a few challengers, including Democrat Carolyn Long, a political-science professor. The state’s Democratic members of Congress face lesser-known challengers. Freshman U.S. Rep. Pramila Jayapal, D-Seattle, is being challenged by Craig Keller, a West Seattle Republican who also ran in the last two races for the 7th Congressional District seat. Keller founded a group, Respect Washington, that opposes sanctuary cities and came under criticism last year for mailing flyers to Burien residents listing names and addresses of purportedly undocumented immigrants, accusing them of committing crimes. Authorities called the fliers inaccurate and inflammatory. Both parties are once again battling over a handful of seats in the state Legislature, where Democrats control the House by two votes and the Senate by a single vote. But Adam Bartz, executive director of the Washington Senate Democratic Campaign, said his party’s accomplishments — including school funding and a one-time property tax cut — in this year’s short legislative session will persuade voters to back Democrats. “We saw how much was accomplished in this one 60-day session,” he said. In the state House, there are roughly a half dozen potentially competitive legislative districts in King, Pierce and Snohomish counties, as well as the Olympic Peninsula and Southwestern Washington. Perhaps the most contested race is east King County’s 5th Legislative District seat that opened up by the retirement of Rep. Jay Rodne, R-Snoqualmie. Former GOP Rep. Chad Magendanz, who in 2016 lost by a razor-thin margin in his bid for state Senate, will face Democrat Bill Ramos, an Issaquah City Council member, for that seat. Meanwhile, Republicans are challenging Democratic House seats on the Olympic Peninsula and Southwest Washington, where Trump in 2016 flipped a handful of longtime Democratic strongholds, such as Grays Harbor and Pacific counties. In the 19th Legislative District, two Republicans — Joel McEntire and David Parsons — have filed to challenge Rep. Brian Blake, D-Aberdeen. In the other seat, freshman Rep. Jim Walsh, R-Aberdeen, will face Erin Frasier, a Democrat and employee of the state Board for Washington Community and Technical Colleges. In south King County’s 47th Legislative District, Democrat Debra Entenman, a longtime aide to Congressman Adam Smith, is challenging Rep. Mark Hargrove, R-Covington. Former King County Democrats chair Bailey Stober, who resigned amid misconduct findings, had announced he would run for that seat, but changed his mind. In the state Senate, Democrats are seeking to capture a handful Republican seats around the Puget Sound, while Republicans are focusing on challenging two seats in King and Snohomish counties. In the 30th Legislative District, Sen. Mark Miloscia, R-Federal Way, will face Federal Way School Board president Claire Wilson and precinct committee officer Tirzah Idahosa, both Democrats. In the 47th Legislative District, Sen. Joe Fain, R-Auburn, will face Mona Das, a Democrat and owner of a mortgage business, who shifted to the race after dropping a congressional bid. Democrats also have their eyes on Sen. Doug Ericksen, R-Ferndale, who temporarily worked for the Trump administration’s Environmental Protection Agency. Democrats Pinky Vargas, a Bellingham City Council member, and Tim Ballew, former tribal chairman of the Lummi Nation, are challenging Ericksen for the 42nd District seat. Republicans, meanwhile, hope to unseat Sen. Steve Hobbs, D-Lake Stevens, in Snohomish County’s 44th District, and freshman Sen. Manka Dhingra, D-Redmond, in the Eastside’s 45th Legislative District. Republican business owner and naval veteran Doug Roulstone and Libertarian Jeremy Fitch have filed against Hobbs. Challenging Dhingra, whose special election win last year gave Democrats their Senate majority, is Dale Fonk, chairman of the 45th District Republicans.